This Heart diamond is 0.71 carat in weight, and comes with Very Good polish and Good symmetry, as verified from an independent gemological laboratory. The diamond is graded H in colour, and has a clarity grade of SI1. The diamond's GIA grading report number is 2247030412, which will detail further its specifications and measurements, and will also come with the purchase of the stone. AUD 3,635 Excl. Duties / Taxes. This Heart diamond is 0.9 carat in weight, and comes with Excellent polish and Very Good symmetry, as verified from an independent gemological laboratory. The diamond is graded E in colour, and has a clarity grade of SI1. The diamond's GIA grading report number is 1295938325, which will detail further its specifications and measurements, and will also come with the purchase of the stone. AUD 2,491 Excl. Duties / Taxes. This Heart diamond is 0.76 carat in weight, and comes with Very Good polish and Good symmetry, as verified from an independent gemological laboratory. The diamond is graded I in colour, and has a clarity grade of SI2. The diamond's GIA grading report number is 6282794129, which will detail further its specifications and measurements, and will also come with the purchase of the stone. AUD 85,167 Excl. Duties / Taxes. This Heart diamond is 4.52 carat in weight, and comes with Very Good polish and Good symmetry, as verified from an independent gemological laboratory. The diamond is graded F in colour, and has a clarity grade of SI1. The diamond's GIA grading report number is 2175840304, which will detail further its specifications and measurements, and will also come with the purchase of the stone. AUD 3,495 Excl. Duties / Taxes. This Heart diamond is 0.9 carat in weight, and comes with Very Good polish and Very Good symmetry, as verified from an independent gemological laboratory. The diamond is graded F in colour, and has a clarity grade of SI1. The diamond's GIA grading report number is 6302367423, which will detail further its specifications and measurements, and will also come with the purchase of the stone. This Heart diamond is 1.02 carat in weight, and comes with Very Good polish and Good symmetry, as verified from an independent gemological laboratory. The diamond is graded H in colour, and has a clarity grade of SI1. The diamond's GIA grading report number is 2141912932, which will detail further its specifications and measurements, and will also come with the purchase of the stone. AUD 20,745 Excl. Duties / Taxes. This Heart diamond is 2.01 carat in weight, and comes with Very Good polish and Good symmetry, as verified from an independent gemological laboratory. The diamond is graded F in colour, and has a clarity grade of SI1. The diamond's GIA grading report number is 5151415305, which will detail further its specifications and measurements, and will also come with the purchase of the stone. AUD 45,344 Excl. Duties / Taxes. This Heart diamond is 3.01 carat in weight, and comes with Excellent polish and Very Good symmetry, as verified from an independent gemological laboratory. The diamond is graded H in colour, and has a clarity grade of VVS2. The diamond's GIA grading report number is 2191634795, which will detail further its specifications and measurements, and will also come with the purchase of the stone. AUD 2,658 Excl. Duties / Taxes. This Heart diamond is 0.73 carat in weight, and comes with Very Good polish and Good symmetry, as verified from an independent gemological laboratory. The diamond is graded H in colour, and has a clarity grade of SI2. The diamond's GIA grading report number is 1176082297, which will detail further its specifications and measurements, and will also come with the purchase of the stone. AUD 28,160 Excl. Duties / Taxes. This Heart diamond is 1.9 carat in weight, and comes with Excellent polish and Very Good symmetry, as verified from an independent gemological laboratory. The diamond is graded F in colour, and has a clarity grade of VS2. The diamond's GIA grading report number is 2195805301, which will detail further its specifications and measurements, and will also come with the purchase of the stone. AUD 72,841 Excl. Duties / Taxes. This Heart diamond is 3.52 carat in weight, and comes with Very Good polish and Very Good symmetry, as verified from an independent gemological laboratory. The diamond is graded F in colour, and has a clarity grade of VVS1. The diamond's GIA grading report number is 2297768436, which will detail further its specifications and measurements, and will also come with the purchase of the stone. AUD 15,110 Excl. Duties / Taxes. This Heart diamond is 1.51 carat in weight, and comes with Very Good polish and Good symmetry, as verified from an independent gemological laboratory. The diamond is graded E in colour, and has a clarity grade of VS2. The diamond's GIA grading report number is 2155289316, which will detail further its specifications and measurements, and will also come with the purchase of the stone. This Heart diamond is 0.9 carat in weight, and comes with Very Good polish and Very Good symmetry, as verified from an independent gemological laboratory. The diamond is graded E in colour, and has a clarity grade of VS1. The diamond's GIA grading report number is 2278828653, which will detail further its specifications and measurements, and will also come with the purchase of the stone. AUD 25,909 Excl. Duties / Taxes. This Heart diamond is 2.69 carat in weight, and comes with Very Good polish and Good symmetry, as verified from an independent gemological laboratory. The diamond is graded F in colour, and has a clarity grade of SI2. The diamond's GIA grading report number is 2151769331, which will detail further its specifications and measurements, and will also come with the purchase of the stone. AUD 81,787 Excl. Duties / Taxes. This Heart diamond is 5.01 carat in weight, and comes with Excellent polish and Very Good symmetry, as verified from an independent gemological laboratory. The diamond is graded E in colour, and has a clarity grade of SI2. The diamond's GIA grading report number is 1208815690, which will detail further its specifications and measurements, and will also come with the purchase of the stone. AUD 5,917 Excl. Duties / Taxes. 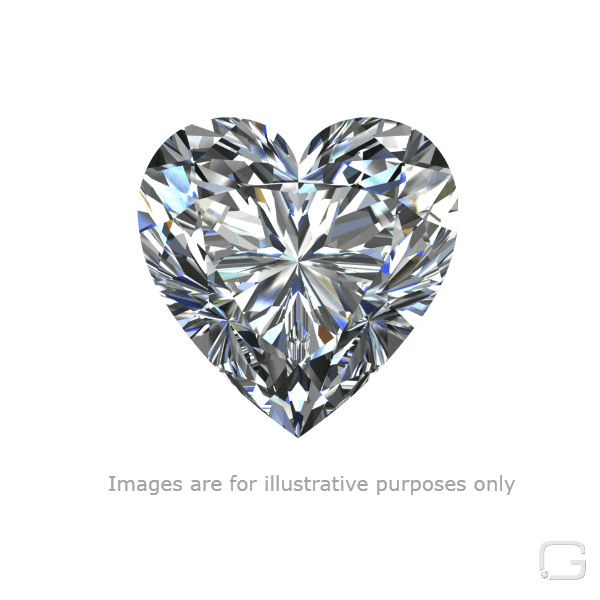 This Heart diamond is 1.11 carat in weight, and comes with Good polish and Good symmetry, as verified from an independent gemological laboratory. The diamond is graded I in colour, and has a clarity grade of VS2. The diamond's GIA grading report number is 1149654038, which will detail further its specifications and measurements, and will also come with the purchase of the stone. AUD 1,02,077 Excl. Duties / Taxes. This Heart diamond is 5.02 carat in weight, and comes with Excellent polish and Excellent symmetry, as verified from an independent gemological laboratory. The diamond is graded D in colour, and has a clarity grade of SI1. The diamond's GIA grading report number is 6193490674, which will detail further its specifications and measurements, and will also come with the purchase of the stone. AUD 5,533 Excl. Duties / Taxes. This Heart diamond is 1.32 carat in weight, and comes with Good polish and Good symmetry, as verified from an independent gemological laboratory. The diamond is graded J in colour, and has a clarity grade of VS2. The diamond's IGI grading report number is S3F68775, which will detail further its specifications and measurements, and will also come with the purchase of the stone. AUD 5,480 Excl. Duties / Taxes. This Heart diamond is 1.04 carat in weight, and comes with Very Good polish and Very Good symmetry, as verified from an independent gemological laboratory. The diamond is graded D in colour, and has a clarity grade of SI2. The diamond's GIA grading report number is 6322150724, which will detail further its specifications and measurements, and will also come with the purchase of the stone. AUD 1,772 Excl. Duties / Taxes. This Heart diamond is 0.5 carat in weight, and comes with Excellent polish and Very Good symmetry, as verified from an independent gemological laboratory. The diamond is graded F in colour, and has a clarity grade of VS1. The diamond's GIA grading report number is 7322228933, which will detail further its specifications and measurements, and will also come with the purchase of the stone. AUD 11,632 Excl. Duties / Taxes.